There's only so much chocolate, jigsaw puzzles and cat calendars a climber can take before their head pops. Help them out this Christmas by gifting them with something that actually sets their climbing vibes tingling. Whether they're a style-thirsty boulder monkey or need assistance organising all that metalwork they're lugging around, we've got the gift buying beta that you need to top the popularity charts this Christmas. We put a great deal of time into ensuring that all our climbing bags fit the bill when it comes to practicality. 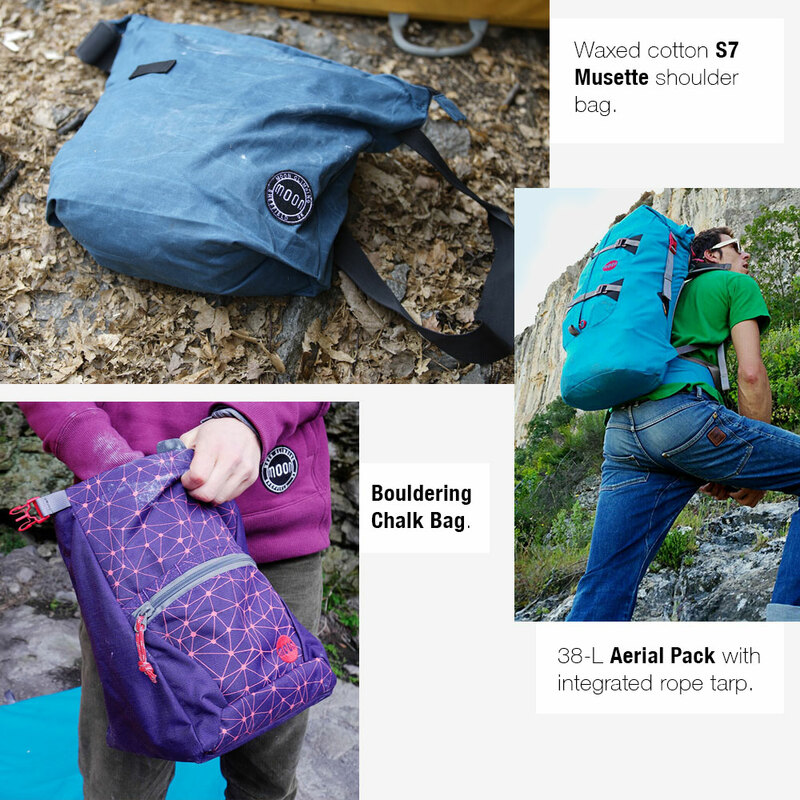 From chalk bags to crag backpacks, durability, plentiful storage, and carrying comfort feature in every single one. The Waxed Cotton S7 Musette was inspired by those cool lunch bags racing cyclists get thrown at them mid-ride. It's one of those go-everywhere, do-everything bags. Our version has been made from the "original technical fabric" - waxed cotton - which boasts water and dirt repellent properties. It's also super-durable, so will have no issue being thrown to the side at the indoor gym or sat at the bottom of the crag keeping your lunch safe. If you've got a huge rack - ahem - you'll know how awkward it can sometimes be hauling all your metalwork, rope, shoes, harness, lunch, friend's lunch etc, to and from the crag. We've designed the Aerial Pack to accommodate lots of kit AND ensure every piece of it is accessible at all times. We've put a video together showing off its best bits here, watch it to learn more. Want to see more bags? We've got plenty more where that came from... Check out our full selection of Chalk Bags and other Bags for more styles and colour options. Bouldering, trad, sport, indoor training - our climbing clothing covers the lot. We pour our climbing experience into every part of our clothing's design before rigorously testing each one to ensure it satisfies our tough criteria. Here's a selection of this season's bestsellers - so popular, your grateful "giftee" will forever be in your debt. Keep him warm during the cold season with a pair of cosy Rainshadow Pants. These slim leg, fleecy joggers are a big favourite amongst the Moon Climbing team this season. You may have to fight him to get them in the wash. The Striped Long Sleeve Tee is another thermal essential for cold climbing days. It's made from super-stretchy, thermal fabric with raglan sleeves for unrestricted shoulder movement. Wear it as a solo layer, a base layer or a mid-layer. Bamboo and Organic Cotton are the not-so-secret ingredients in the Moon Logo Tech Tee. This clever combination makes our climbing tech tee naturally deodourising and quick-drying. Perfect for hot, sweaty sessions. The Meteor Jacket is our answer to every crag and boulder field climbers insulated jacket wishes. A rock-ready hardwearing outer, cosy insulation, big pockets and quilted stitch detailing... Okay so perhaps it's just us that dreams about stitching BUT you can't deny that it's a nice finishing touch. 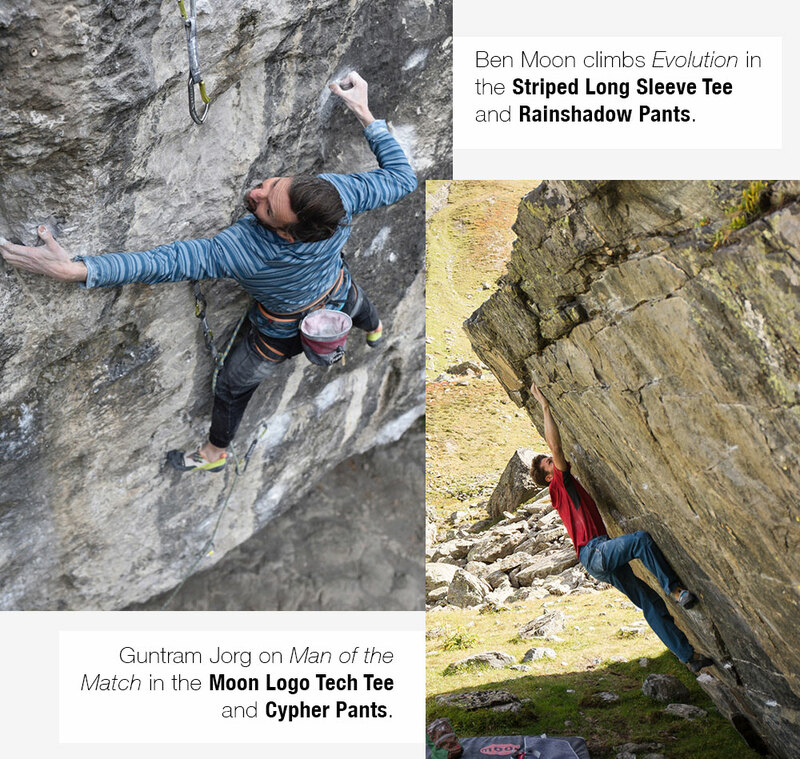 Discover the full collection of Moon Climbing menswear here. If she loves leggings as much as we do, she'll appreciate every inch of the Sigma Leggings. Climbing demands so many different styles of movement - wide stances, high rockovers, dynamic stretches - and we've designed the Sigma Leggings to accommodate all of these. They’re Sigma are 100% opaque (not see-through) with a panel design that’s tailored to move with her. Chilly weather demands warm layers and the Striped Long Sleeve Tee is a versatile solution. It’s super-soft, stretchy and thermal. We use Organic Cotton in all of our T-Shirts and cotton vests as standard. They’re an easy way to add climbing inspired designs to her wardrobe whilst being conscious about the environment too. Shop all women's tops here. 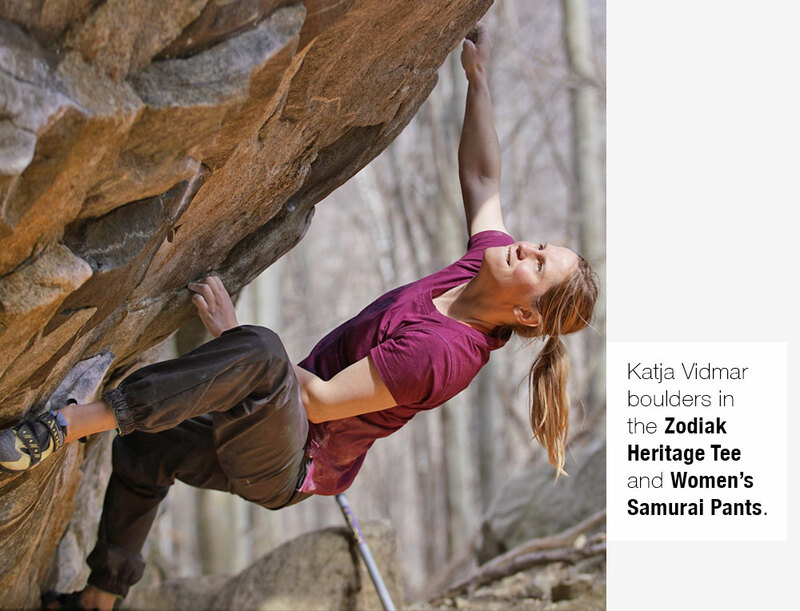 Discover the full collection of Moon Climbing womenswear here.